When you need to encrypt PDF in batch, VeryPDF provides the following options for you to choose. You can compare them then choose the proper one according to your needs. I will list all of them here for you to compare. Brief introduction:there are two versions of this software stated on our website: GUI version and command line version. This software is a professional tool of setting password for PDF files in batch. 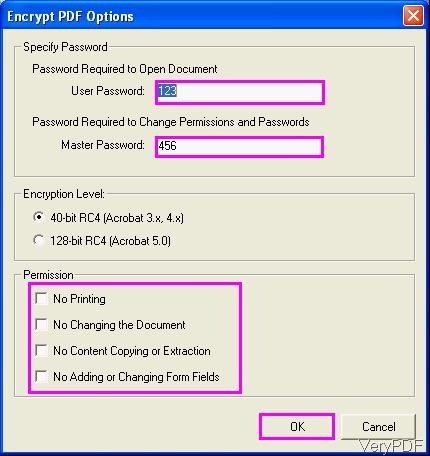 However, this software only have this one function of encrypting PDF. And it is extremely easy to use. This software is good for those who would not like to spend too much on encryption and only need this one function. There are also two versions of this software stated on website: GUI version and command line version. By this software you can stamp PDF and then set password for it. The main function of this software is to stamp PDF file in batch. However, after stamping, this software allows you to stamp PDF in batch. This software is good for those who need to archive PDF files as this software allows you stamp PDF by current date, time, company logo and so on and then set password to protect them. And when you need to set password, please choose command line version. When you need to compress PDF and then encrypt PDF file, please choose this software. And there is no command line version software available of this software. And this is the cheapest choice to encrypt PDF of those three software. By this software, you can convert PDF to PDF/A, compress PDF and then set password to protect the output PDF files. And there are still many tools on VeryPDF website which can be used to encrypt PDF in batch. We will publish articles about them in our knowledge base, hoping you can choose the best one for you. All those software are free downloading and trying, through trying, you can get more about those software. During the using, if you have any question, please contact us as soon as possible. This entry was posted in PDF Compressor and tagged encrypt PDF. Bookmark the permalink.